Set an appropriate text style current, and (optional) turn off running object snaps. Make sure to also set an appropriate layer current before creating the text object. On the Home tab’s Annotation panel, click the upper part of the split button, labeled Text, to start the mText command. Pick a point in the drawing. Type H and press Enter to change the default text height. If applicable, type an appropriate text height. If you’re adding text in model space, you are strongly encouraged to use annotative text. If you want a different justification from the default (top left), type J, press Enter, and choose another justification option. Enter justify multiline text in the Search box of the online Help system if you want an explanation of the other justification options. Pick another point in the drawing. Don’t worry about the height of the rectangle that you create by choosing the second point; the width of the rectangle is all that matters. AutoCAD adjusts the height of the text rectangle to accommodate the number of lines of word-wrapped text. You can adjust width later. The In-Place Text Editor window appears with the tab and indent ruler above it, and the previously hidden Text Editor contextual tab appears on the Ribbon. You may prefer the classic Text Formatting toolbar over the Ribbon’s Text Editor contextual tab. If you want to give the classic version a test-drive, change the value of the system variable MTEXTTOOLBAR. The default value (2) displays the Text Editor tab only; setting the value to 1 displays both the Ribbon tab and the toolbar. Don’t set this variable to 0, unless you want to turn off the Text Formatting toolbar in all workspaces. 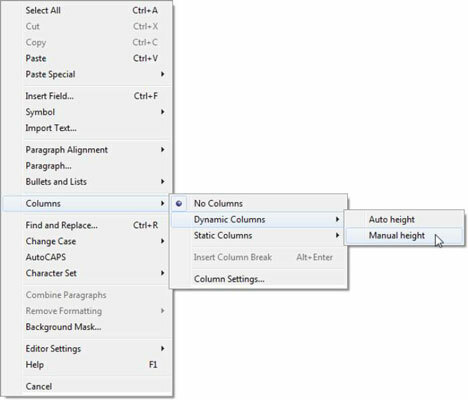 When you create multiline text in either AutoCAD or AutoCAD LT, text objects default to Dynamic Column mode. You can tell that’s what you’re going to get if the In-Place Text Editor displays a double-headed-arrow symbol in the center of the bottom border of the rectangle you define. The initial selection window primarily sets the width. By default, if you enter enough text to fill the window, mText defaults to splitting the text into two columns, as in a newspaper. If you don’t like this arrangement, you can dynamically stretch the text editor window to become wider or longer. 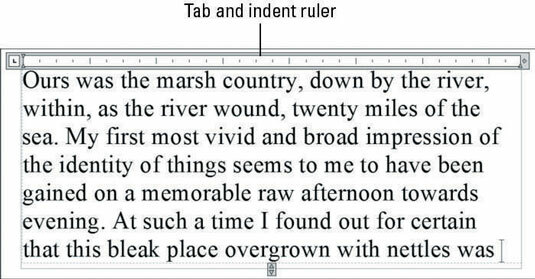 If you never want to use columns in the current drawing, click Columns in the Insert panel of the Text Editor tab, which appears only when you’re creating or editing multiline text. This action sets the MTEXTCOLUMN system variable to 0. It affects only the current drawing, so if you never want columns, set it up in your template drawings. Verify the text font and height. The text font and height should be correct if you properly completed Steps 1, 4, and 5. If you didn’t, you can change these settings in the Font drop-down list and the Text Height text box on the Text Editor tab (or on the classic Text Formatting toolbar). Type text into the text area of the In-Place Text Editor. AutoCAD word-wraps multiline text automatically. If you want to force a line break at a particular location, press Enter. If you want to set other formatting options, select text, right-click, and make an appropriate choice from the menu. By convention in most industries, text in drawings is always uppercase. To always have your notes in uppercase, right-click in the In-Place Text Editor and choose AutoCAPS from the menu. Click Close Text Editor on the Ribbon (or OK on the classic Text Formatting toolbar). The In-Place Text Editor window closes, and AutoCAD adds your text to the drawing. You can close the text editor much more easily by simply clicking outside its window. But if you like clicking buttons instead, AutoCAD has amply provided for you. If you set an annotative text style current in Step 1, assign an annotation scale to the multiline text object. As you can tell by looking at the Text Editor tab (or the Text Formatting toolbar) and multiline text right-click menu, the mText command gives you plenty of other options. You can show or hide the toolbar, the ruler, or the Options buttons, and you can give the In-Place Text Editor an opaque background. Other tool buttons give you access to columns and numbered or bulleted lists. Between them, the Text Editor tab (or the Text Formatting toolbar) and the right-click menu also include a Stack/Unstack feature for fractions, a Find and Replace utility, tools for toggling lowercase and uppercase, options for applying background masks and inserting fields, a special Symbol submenu, and an Import Text option for importing text from a TXT (ASCII) file or RTF (Rich Text Format) file. If you think you can use any of these other features, choose Resources→Commands→mText in AutoCAD’s online Help browser to find out more about them.